Although our publication took some time to complete, it has been one of the most exciting studies that I have been involved. This is because it required a lot of interesting lab and field work (involving a beautiful island chronosequence in northern Sweden), and because it was in collaboration with people who have inspired me ever since I started my career in ecology and soil science as a graduate student. Working on a study system of multiple islands is exciting because it involves a lot of travel from island to island by boat. It is both relaxing and quiet except on windy or stormy days. Several of these islands have their own nickname, from ‘banana island’ because of its shape like a banana to ‘ant island’ (I’ll let you guess why collecting soil cores on this island is awful). No, we didn’t go there just for resting or fishing; we also collected more than 2000 soil cores while some other colleagues were collecting data on the vegetation, sorting litter or picking berries. But, something that was really great during this field trip is that my partner (Claire) was there working with us as a field assistant, despite the fact that she worked as a psychologist in France before moving to Sweden (and it’s not too bad to start in science as the “field assistant of David Wardle”). The only thing that my partner didn’t know at the moment is that you must take care of samples after the field trip, and she helped us to extract soil nematodes in the lab for samples from all 420 plots (quite an unexpected activity for a psychologist). Even though we gave up the idea to write a book about the “psychology of nematodes”, it has been a wonderful experience for us and I’m thankful to my team and colleagues to have helped us to carry out this project together. A second anecdote about this publication is something that I refer to as the “David-drawing”. Among the insightful comments made by the reviewers after submission was the suggestion that similar multifunctionality values among contrasting ecosystems could hide a very different functioning among them, an issue that the reviewer asked us to tackle head-on. 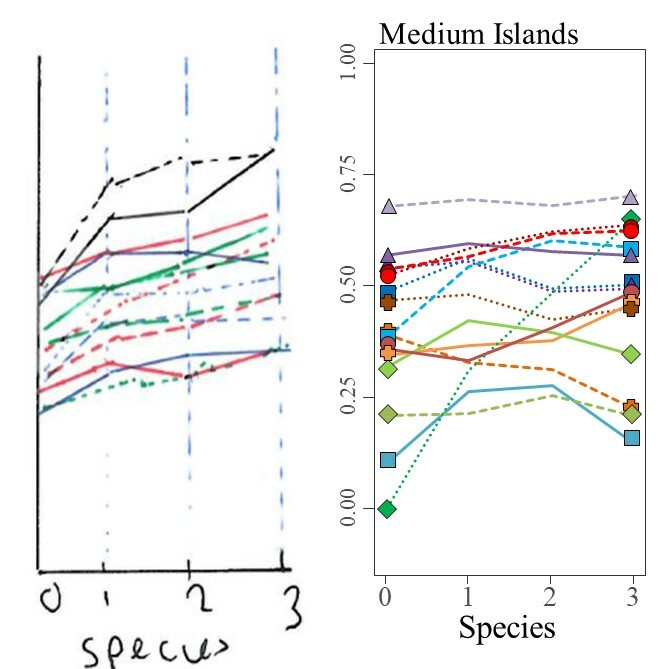 Although we did present this idea in a very early draft of the manuscript, we ended up removing this part by the time that we submitted it so that we could focus more on the central result, i.e., the impact of biodiversity on multifunctionality across contrasting ecosystems. During the revision and in order to address this reviewer’s comment graphically, I prepared a draft new figure to show the correlations between each of the 15 standardized functions and plant diversity and E-mailed it to some of my co-authors. A couple of hours later, my postdoc-supervisor (David) E-mailed me back a rough hand drawn sketch about what he thought was the most effective way of compressing all this information into the least possible space, through showing the mean values for each species level because correlations may hide trends for intermediate values. In French, we have this expression: “une image vaut mieux qu’un long discours” that we could translate by “a picture is worth a thousand words”. I do think that this proverb inspired me and I immediately adopted this new concept and transformed the style of David’s drawing (quite ugly at the first glance, we can say it now), into each of six panels using exactly this style in the revised manuscript; these six panels occupy half of the current Figure 1 of our published manuscript. The ‘David-drawing’ transformed into a new figure based on the collected data. Returning to the main results of our paper, we concluded that similar multifunctionality values across contrasting ecosystems could potentially mask important differences in the effects of biodiversity on functioning among ecosystems. However, although the effects of biodiversity loss on individual functions can vary with ecosystem type because of differences in soil fertility, productivity or biological communities, the effects of biodiversity loss on ecosystem multifunctionality were relatively invariant among contrasting ecosystems. So, if I translate, I would say that to maintain ecosystem functioning, biodiversity is the key (yes I know… again!). And if you want to understand why and how, you know what you have to do (http://go.nature.com/2kegGEK).